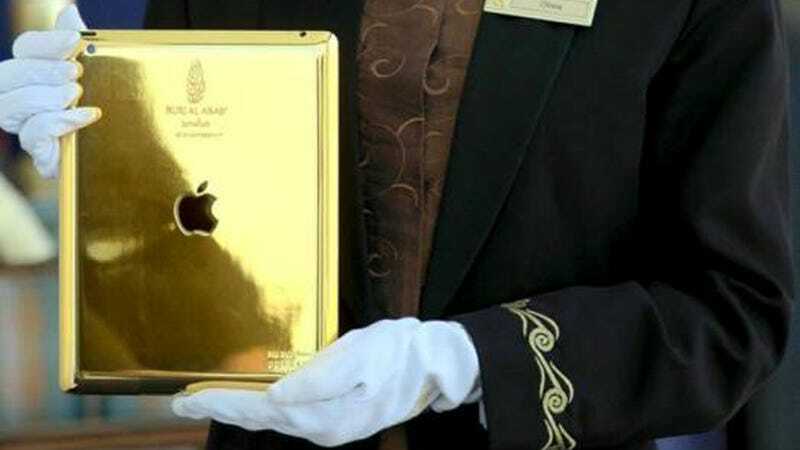 Receiving A Gold Plated iPad At Hotel Check-In Is Normal, Right? You know the drill. You pull up to a Super 8 Motel with the vacancy light on, you argue with the attendent about getting a room away from the ice machine, you whip out your AAA card for extra savings and then you take the 24-karat gold-plated iPad the attendant hands you and head off to your room to stockpile some free soap. Boom. At the (slightly fancy) Burj Al Arab hotel in Dubai the gold-plated iPads are flowing freely. Each guest receives one at check-in so they can use custom "Interactive Customer Experience software" to enhance their stay at the hotel. Let's recall that Burj Al Arab is the hotel notable for looking like a sail in the wind, having the world's highest tennis court (which obviously doubles as a helipad) and being located on a man-made private island less than 1,000 feet from Jumeirah beach.